CinemaCon, Las Vegas, Nevada (April 24, 2018) – Cinionic, the Barco cinema joint venture, and Ultrahaptics, have launched a cutting-edge, turnkey visualization solution that engages patrons in an interactive, sensory experience right in the cinema lobby. Millennials and “digital natives” are driving new trends and feedback-driven experiences. Cinionic and Ultrahaptics have collaborated on the design of innovative digital movie posters – embedded with mid-air haptics and motion tracking technologies – to empower exhibitors with a novel entertainment option for a media-savvy generation. Within Cinionic-enabled lobbies, moviegoers will experience a 3D mid-air “thrill ride” of sorts, engaging in game play with virtual tools and more, feeling sensations like static fields of electricity, bubbles and other phenomena without actually touching the surface of a screen. The possibilities for avatar-like gaming where patrons are actually “in the story” are limited only by the imaginations of the animation producers and the players themselves. Already widely used in many industries such as automotive, healthcare, and smart homes, Ultrahaptics technology not only elevates the user experience, but also provides a safe and extraordinary interface for interacting with content. Now, this technology is improving the way patrons experience digital content in the cinema, increasing consumer dwell time and driving additional revenue opportunities via merchandising and concession sales. Under the arrangement, Cinionic provides the content creation and delivery expertise, derived from its exclusive relationships with studios, with Ultrahaptics supplying the technology platform and software to drive the user experience on the Barco Lobby Experience network. Currently in the final beta testing phase, these virtual touch, haptic movie posters will be implemented at test sites for user feedback and data gathering. 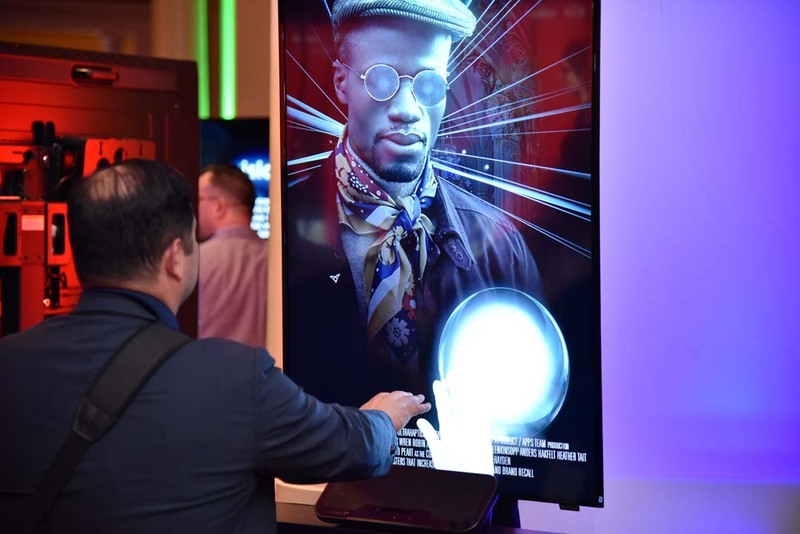 Visitors can experience Cinionic’s virtual touch display in action at CinemaCon, April 24-26 near the Milano and Neopolitan rooms at Caesars Palace in Las Vegas, Nevada.